My father (are you sensing a common thread here?) was asked to go to Moscow, USSR for two years, and he accepted. So I was there from 1977 to 1979. We lived on a lovely street called Kutuzovsky Prospekt; our apartment building was #13. I believe we lived on the third floor in a fabulous cockroach-infested three-bedroom apartment. We had a balcony that noone dared step on, lots of funny circular things in our walls, and people who came in and rearranged our stuff when we were gone. Such was life behind the Iron Curtain. We lived down the street from Leonid Brezhnev, the premier-at-the-time, and we always knew he was on the road, because of the fleet of black cars with lights and sirens surrounding his car. We owned a sleek Zhiguli car, which was the predecessor to the Lada. Strangely enough, we had few problems with it, except for the alternator dying on a trip to West Germany. We flew out of the Soviet Union for the last time in July of 1979. When we landed in Frankfurt, (West) Germany, everyone on the plane cheered. It was good to leave. 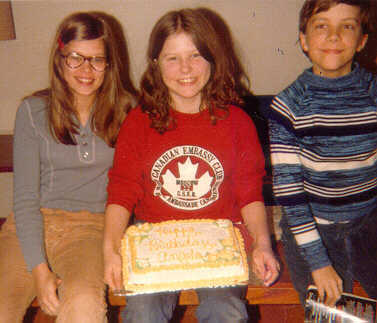 Debbie Studley, Angela and I at Angela's birthday, March 1979. Debbie was technically my first girlfriend - I was browbeat into going out with her. :) Smokey. He found us one snowy evening in Moscow, and came to Canada with us. 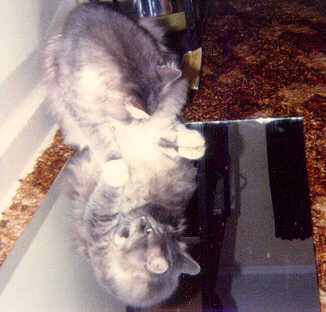 He was a great cat. This is actually from July 1979, and he is checking out his new home in Canada.